The HSM SECURIO P36 CC-3 + CD is a Mobile, High Performance 4.5X30mm shredder for entire Departments and Office Floors. Features a multi-function operating button, reversing button and integrated button lock and will auto-reverse in the event of a paper jam. This SECURIO P36 CC-3 + CD model also has a separate CD cutting unit, which shreds to security level P-4 and a CD waste container for correctly sorted separation of the shredded material. The SECURIO P36 CC-3 + CD model has a folding safety element with contact protection and integrated service flap. Also features an Automatic Oiler for the cutting unit and Economic energy management (EMCS). 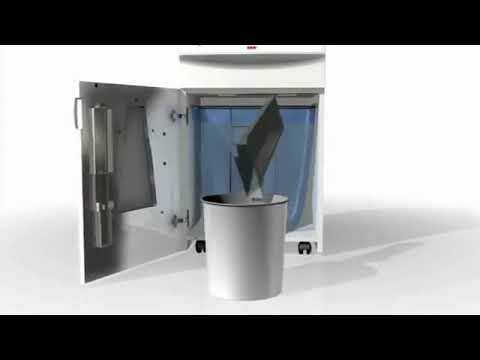 The filling level of the large removable, reusable waste bag is displayed through an inspection window. Made in Germany. The SECURIO P36 CC-3 + CD machine is very simple to use. Simply select the different functions with a single control key: start, stop, temporary and permanent mode. In the event of a paper jam, the reverse function starts automatically. Quiet operating sound and attractive functional design, the SECURIO P36 CC-3 + CD fits into any style of office without disturbing the operator. For CD/DVD Media Destruction approved to Highest Security Level Order the SECURIO P36 CC-4 and add the special OMDD Media Cutting Head. The use of a P-4 shredder such as the SECURIO P36 CC-3 + CD will aid your GDPR compliance.